Did you realize that CHRISTMAS is coming in just a little over FOUR MONTHS?!? Here at Quilt and Sew, we want to help you get ready!! So, we have lots of exciting events, sales, and specials coming up. Watch for a newsletter every other week to find out what is featured! CHRISTMAS KICKOFF: Saturday, August 11, we will have Christmas cookies and punch throughout the day! FREE PATTERN!! Every other week, we will have a new, FREE pattern available to all who come in. The patterns will be for items that are quick to make—for yourself, or for a gift. DRAWINGS MONTHLY: Each time you make a purchase, beginning August 11, you may put your name in a jar for a chance to win a $25 gift certificate. Drawings will be held on the first business day in September, October, November, and December! The more purchases you make in that time frame, the better your chances to win! This Week's Free Pattern: Shown in fabric for the Christmas season. Pattern gives you yardage for multiple sizes. And check out this pair of elves hanging out with the Christmas prints in the Holiday Room. We have panels available so you can make a set of your own! 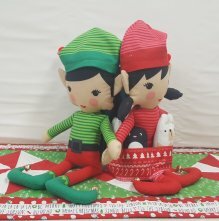 BI-WEEKLY SALE—August 11-25 only—Everything located in our Holiday Room (fabrics, precuts, patterns, kits, gifts, etc.) is 15% OFF!! HOT DEAL #1—August 11-25 only—while supplies last! Camelot’s Indigo Rose strip sets, regularly $50.29, now $35. Camelot’s Indigo Rose charm set, regularly $19.20, now $12. 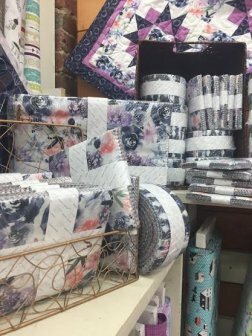 Camelot’s Indigo Rose 10” square set, regularly $50.49, now $35.